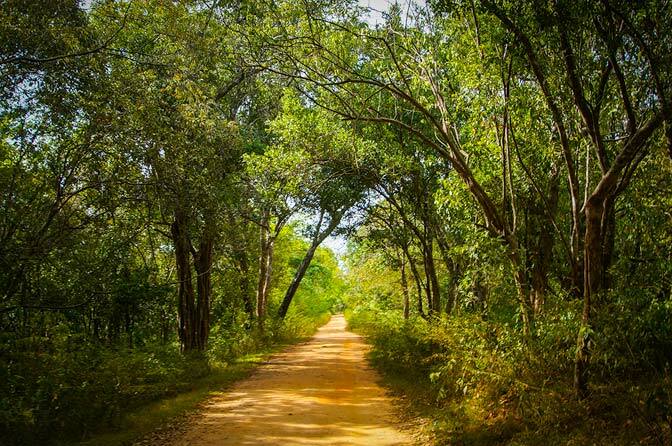 Our round trip journey to Sigiriya Rock included 7+ hours riding 4 different buses. One of them had way more people than it should have, (at least by American standards) and we spent 45 minutes standing in extremely close contact with several other Sri Lankans. By close contact, I mean I was touching four or five other people at any given moment during that ride. And that was before another ten people got on. I should also mention that I was unable to stand up straight. 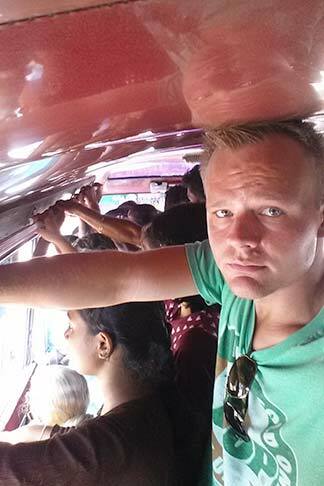 Close quarters in bus to Sigiriya. Our round trip costs for all bus rides came to 560 rupees or $4.29 USD, for both of us. Compare that with what our hotel was offering (and strongly pushing us to take) of round trip transportation (private car instead of bus) for $50 USD. If my math is right, that’s a difference of $45.71. Granted, the car would have shaved a few hours off the trip and no doubt been much more comfortable, but that’s still a chunk of dough for a couple that quit their jobs to travel the world for a year. The other money-saving opportunity we had was visiting the attraction itself. 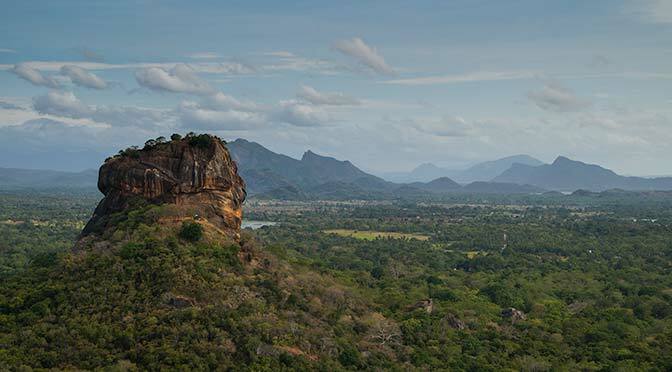 There is a rock called Sigiriya that sticks up 200 meters out of the ground. The entrance fee to the grounds and the opportunity to climb the steps to the top comes to 3,950 rupees per person. That’s a total of $60 USD for both of us. 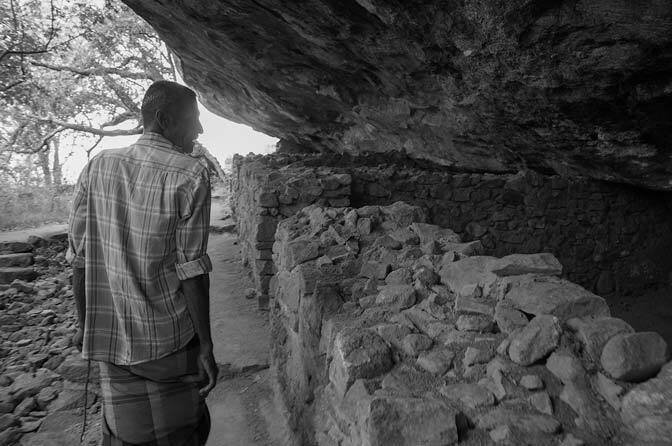 Laura, by researching the attraction, found another rock, called Pidurangala, that’s practically right next door. Just 1 km away. 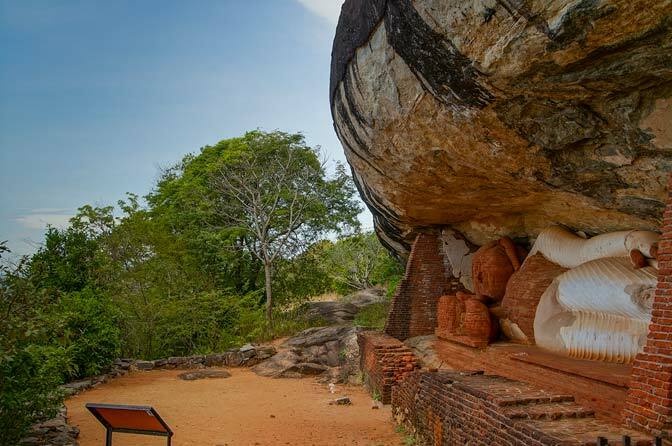 Not only is this rock pretty much the same height, it offers a view of Sigiriya rock that you obviously don’t get when you’re on top of it. We did miss out a bit on some ruins and artifacts on top of Sigiriya, but we’re ok with that. 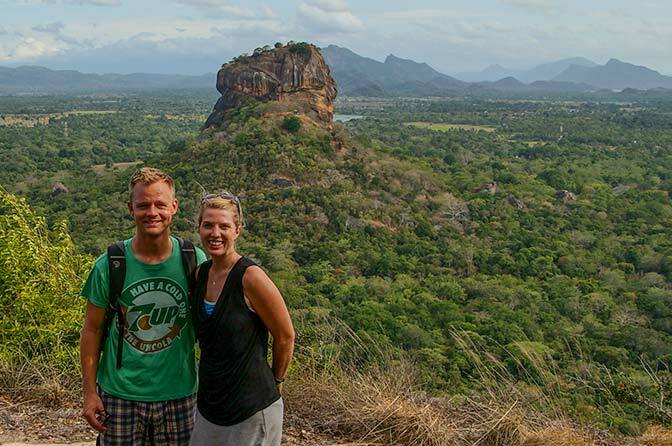 Us on Pidurangala with Sigiriya in background. The cost advantage of option 2? It ran us 900 rupees total for both of us (less than $7). That saved us over $50, and gave us what we’d consider to be a better experience. A.K.A., we had the rock to ourselves, and didn’t see another tourist the whole time. That price also included a local guide to show us the trail and help us avoid cobras along the way. In hindsight, we probably didn’t even need the guide, but oh well. It probably made things easier. Walking past Buddhist meditation rooms on Pidurangala. All said and done, we spent 7+ hours in less-than-comfortable buses traveling to see Sigiriya and Pidurangala, and we did it for nearly $100 less than the default option. So if we did it again, we’d probably do it the same way. The question is whether it was worth that much time in a bus for an hour at the attraction. Probably worth it, but hard to say. Buddha statue under rock outcropping on Pidurangala. It was certainly a good cultural experience, and it’s hard to put a price on that (time or money). Also, the view was quite amazing. Not sure the photos do it justice, so you’ll just have to trust me. Tricky part of trail on Pidurangala. Lovely monkey near Sigiriya entrance. Start of path up Pidurangala. Buddhist meditation room on Pidurangala. Sigiriya rock from the road.